The first thing to do is to CREATE A PROJECT (read here) which you can do from the link “Add Project” at the right of each screen. Then CREATE A TASK (see here) – you will be prompted to do this. 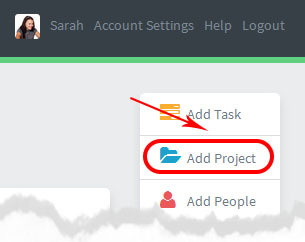 You can also create a new TASK LIST (read on) to put the task into. (This is optional: The task will go under the default ToDo task list). It will also show in your Calendar – if you gave it a due date. Click on the task in any list / overview screen to open it and change it. Now go ahead and create more tasks, and projects and see how they appear in the various screens. It’s quick and easy and you can easily remove any task (read how) later.